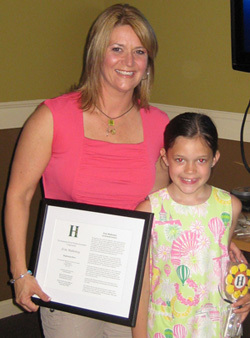 Girl Power Go, LLC is an amazing program that has had such a profound and positive impact on our daughter’s life. She is 8 years old and suffers from Generalized Anxiety Disorder, Social Anxiety Disorder, Sensory Processing Disorder and possible Selective Mutism. At home, she is outgoing, loud and active. However, school and social situations are extremely stressful for her and she often becomes paralyzed and unable to speak. It’s as if she lives a double life. The beautiful, smart, strong and hilarious child we know at home struggles so much to get through everyday life and ordinary social situations. It is heartbreaking to see. Recently, her 3rd grade teacher reported that she is gradually becoming able to participate in class, specifically during the morning meeting time when students are required to greet their classmates in a loud, clear voice. In the past, she would cry and hide her face. She eventually started to wave to the other students instead of hiding, and most recently has been able to vocalize her greeting to them and her teachers. Last week she even participated in an activity that required her to share something about herself. This might not seem like a big deal for most children, but for her it was a huge milestone. Girl Power Go, LLC has been instrumental in helping her to gain confidence and to find her voice. Thank you from the bottom of my heart for helping her to recognize the strength, power and courage that we always knew was inside of her. Erin Mahoney is a positivity powerhouse! She presented " Girl Power for Brownies: A Two-Part Program" to the Girl Scout Brownies that I co-lead with Kristine Austin. The girls not only learned a lot during this inspirational program, they also had a blast. Thanks once again for a wonderful evening with our girls. They simply love you. We talked about what they learned and they talked on and on. You are doing really important work... motivator, role model, friend, teacher... we are blessed to have you in our girls' lives.